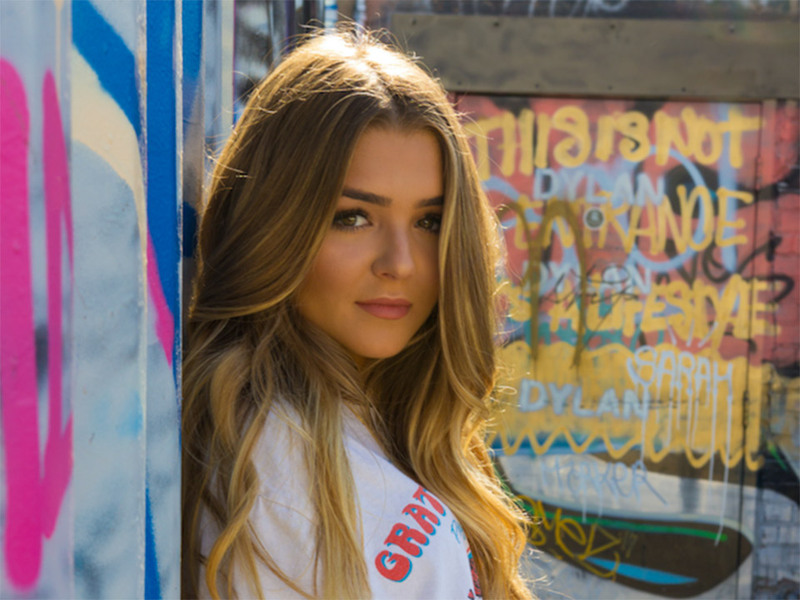 Our interview with gorgeous 17-year-old Long Island, NY native, singer-songwriter Gabi Sklar who has spent the last year writing and recording music with multi-platinum producers, Julian Bunetta, Ryan Marrone, Frequency, xSDTRK, Jon Levine, Jonas Jeberg, Matt Squire, Tofer Brown and Andrew Hollander. In part with recording credits, she has been training weekly with vocal coach, Don Lawrence (Lady Gaga, Mark Ronson) and performance coach, KJ Ross (Diddy). She has performed in New York City, Los Angeles and traveled to Beijing, China, where she performed a 10-day music tour, which was covered by various Chinese news outlets. Hi Gabi, please tell us a little about you? I’m a seventeen year old singer-songwriter from New York! I just released my new single “Liberteens” and I’m super excited about it. Music has always been apart of my everyday life. I started taking it seriously when I was fourteen and have been flying back and fourth from New York to LA since to write and record. My family has always been very artistic, whether it was involving music, photography, makeup, art. At the moment, I really admire Dua Lipa. Her artistic style is really cool and her voice is awesome. I love the way she carries herself. I want to put out an album, but i’m working one step at a time. Hopefully a solid EP before then. I want to be able to perform and influence my fans the same ways my inspirations influence me. Tell us about your new single “Liberteens”? The song talks about what it’s like to be sixteen, but beyond that, it’s meant for people to think back to their teenage years. Whether you are sixteen, thirty, fifty, etc., it’s meant to reflect on times of reckless adolescence. The word Libertine is defined as a rebellious, free spirit. We took that name and changed the spelling to Liberteen because your teen age years are when you’re the most rebellious and reckless. Define your music style in 3 words? Did you write any of the songs your working on? For sure! I write and sing every song I release. I put out a single I wrote when I was 14 called “LA Changes You”. I wrote that entire song myself because I like to keep my music personal to myself, my fears, and my life experiences. Liberteens was written by myself and an extremely talented writer, Troi Irons. My style is all over the place; I love Lana Del Rey, Gavin DeGraw, Dua Lipa, Arctic Monkeys, sometimes you’ll hear me bumpin The Killers or Drake. It depends how i’m feeling that day. I love photography, fashion and makeup. My mom was a makeup artist so I used to watch her do her makeup all the time. New music is coming your way, and check out my new single Liberteens! I think social media is a really cool platform to have. It’s changed the way of the industry completely, and it allows you to discover really talented, cool people and artists. Celebrity Crush: don’t have one! !